I began my journey into art when I was in second grade making dark cartoons and after I was almost expelled from my school I decided to focus on math. I made my way back into art when I was a sophomore in college attending Business school at Chapman University. My style is comprised of manic colors, intricate details, and crisp lines. I start every piece without a destination in mind and upon completion, I write a story about the emotions/feelings I felt while creating the piece or the emotions I felt from my environment. I love to use bright, bold colors that evoke strong emotions while adding a balance of black work in the form of hard edge and soft lines. You can follow my process on instagram at @salinamendozaart or visit my website: salinamendoza.com. Sculpture has been my main focus since I started and graduated from Academy of Art University. I've always been intrigued by furniture design as it is a form of sculpting wood to curve and bend in various ways. I enjoy creating functional pieces in someones life that can live with families for generations. The color choices in my chair sets mimic barn wood and metal patina color schemes. I am drawn to create abstract paintings that draw the viewer in with a sense of wonder. Imaginative paintings that take them away to another place for just a few moments, giving them a sense of peace, and having some relief from this complicated world that we live in. I would describe my art style as abstract art that is imaginative and alive. Imaginative in that the images come from my imagination, not things that I have seen. Alive in that I attempt to breathe my emotions and life experiences into the painting, so it has a heart and soul. One of the most profound events in my life was when my son was diagnosed with a serious mental illness at the age of 22. Watching his painful struggle to just to survive and not being able to fix it, caused me intense emotional pain. I knew I needed to channel that pain in a positive way. I knew I needed to put those intense emotions somewhere, and I decided to put them on canvas. 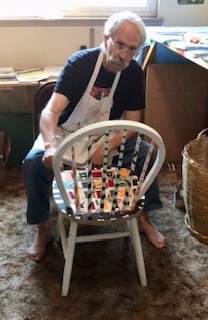 My design and color choices for my chairs are based on a colorful, woven textile I saw in Marrakech, Morocco in 2016. The colors were vibrant and mixed beautifully together. The technique I used was to add layer upon layer of color in a loose crisscross type of pattern. Trying to make the pattern imperfect, gives the chair depth and a casual ease. A creator, a plethora of color and born from the body of our earth, the depth of the soul to the outer limits of the energy surrounds the mental body of Skye Amber Sweet. Her love in sharing the intensity and the passion for the becoming of heArt to self, in an adventure; a journey only she can create. There is a great peace from being gentle in the chaos of manipulating a canvas or a wall; the muralist eye on what story she hopes to tell with minimal brushes and thought. With emotion, reasoning is silent yet abundant and Skye Amber Sweet can take complication and simplify it into a beauty that can melt a heart. Art has always been a calling, one conversation away yet so far when working in the design industry for over seventeen years. As fate would have it, the serendipitous timing of a crashing sector leads her to pursue talents unknown and opportunities in sharing more of her heart. Skye Amber Sweet is a multi-faceted artist, from street art to country wildflowers, her love of Earth and outdoors shine through in creating "Just Real Furniture" in the city she calls home; Silver Lake. Bringing softness to a bold pallet are childhood memories, as to mental lyrics to an old country song by Patsy Cline. Skye Amber Sweet's art can be found on walls across California and Nevada and her canvas art readily available in her studio in Silver Lake, or at the touch of a button in calling her for your own Skyepoet commission close to your HeArt. Every day I create. I can’t stop. I have so many ideas and am always curious about the process and how it unfolds. Sometimes these ideas come to full fruition and other times there’s a new idea calling for louder attention. I also create to maintain a sense of hope in a world that seems to be ever changing from the innocence of how I was raised in the Connecticut suburbs. I call myself a “Conscious Seed Planter” because art, along with my words of what inspired me to create it, can evoke a change as a result of the observer’s interaction with it. I also love the idea of leaving behind a legacy of work that can be appreciated by my family for years to come. Intuitively expressive, frenetic bold color choices that lead to a feeling of being eternally hopeful. There’s no rhyme or reason to it; it’s wherever spirit leads me to for that particular time of creating. What is one personal thing about your story that helped pull you into being an artist you can share? . I like to ground myself before creating, whether it be meditating, yoga or other self help tools learned throughout the years. In fact, I often practice yoga and get so many ideas as a result of tuning into my intuition. What inspired you to paint your design and color choices on your chairs? In order to connect with my mom who has a recent diagnosis of Alzheimer’s Disease and lives on the east coast, I have been doodling using digital art as the medium. My mom doodled a lot when I was growing up. My color theme has been turquoises, pinks and purples, with FLOWERS as the abstract theme. I decided to “doodle” on a digitally created chair in order to play with color choices and ideas instead of wasting paint. This allowed me to be more purposeful with the execution of these ideas. My mom doesn’t like my abstract art, as she is more a realist in every sense of the word. She does, however, continue to doodle, and for that, these chairs were born. Over the many years I have made art, artists have painted their cupboards and furniture to spruce up their environments at home. This has been an opportunity for me to do just that for others who also take an interested in this kind of art, and to see it commercially. The colors I chose for this project were reminiscent of those used by Hispanic artists in similar settings. My father was an animation artist in Hollywood. I was so intrigued as a youngster with what he did in his profession that I dreamed of doing something just as creative. These goals are what I have realized over my lifetime. You can see more of my Art on Facebook at Geoffrey E Levitt and GeoffreyELevitt.com. My name is Samantha LeDuc. I am a mixed media artist that focuses on abstract with illustrations. I am originally from England and now reside in Redondo Beach. I have been an artist for several years starting when I was in school dabbling with paints. I set them all down for a while for a family and a career. Now as an empty nester I have time to spend on painting and illustrating. My love of illustrating and abstract art has now merged together working with an abstract background and then finding the perfect illustration to add to it. Faces Of Hope is call my concept, 1994 started to draw faces and felt a sense of hope cause I found my creative outlet and my language of expression. Murals, paintings,games, books, tennis shoes, furnitures and many more items. For these 2 chairs, the white one is represent the faces of hope as the simpliest form and color "black and white. The blueone concept is wrapped on canvas for texture and protection cause I dislike chairs being damage. I personally never seen a chair wrapped on canvas before.